UTRECHT - At the world congress 2000 in Springfield, Richard Strauss presented a new design for a carillon keyboard. Strauss, who has a long career regarding technical improvements of carillon installations, made his first keyboard in 1983 for the carillon of San Antonio, Texas. In Berkeley he carried out technical improvements at the carillon of the University of California. Since 1999, Strauss is associated with the Verdin Company, Cincinnati, Ohio, as the carillon engineer. Thanks to his well thought-out ideas and the financial support of Verdin a new keyboard was designed that has been well received. Since the introduction of the European standard keyboard in 1983, this keyboard has been criticized a lot. This criticism was about the depth of the keystroke, the distance between manual and pedal, the manual-pedal axis for three-octave keyboards, etc. Each European carillonneur who has ever played an American keyboard will have the same experience as I had: you have to adapt a little, but how comfortable it is to play that pedal! The manual keys are however too far apart, certainly when you have to play a passage in the fourth octave combined with some low bass notes. Then try to keep your balance! Since 1983 a lot of research has been done towards changes in the European standard keyboard, but also in the United States developments were being made. However, an elaborate proposition for a possible world standard had not yet been presented. The Keyboard 2000, as Strauss has called the new keyboard, is a further development of the hybrid keyboards that have seen daylight in the last 10 years in The Netherlands combining a European manual with an American pedal. Already in 1990 a keyboard was placed in the Old Church of Amsterdam where efforts were made to unite the two standards. It was an initiative of Todd Fair, who was then city carillonneur of Amsterdam and president of the WCF keyboard committee. The manual key centers were 48 mm, which is the middle between 50,8 mm of the American keyboard and the 46 mm of the European. The pedal had the American standard and was reaching from c1 to a2. In the mean time Gert Oldenbeuving has ordered new keyboards for the carillons he plays in Nijmegen, Zutphen and Lochem with a European manual (key centers 46 mm) and a smaller American pedal (key centers 85 mm instead of 89 mm). He used the same starting points, as did Strauss for his Keyboard 2000. Strauss has developed the Keyboard 2000 without seeing any of the above-mentioned keyboards. He combined the best elements of the existing standards: the compactness of the European manuals and the comfortable American pedal. The Keyboard 2000 is dimensioned in a way that the radial and concave construction of the pedal keys and the position of the hinge points fulfill ergonomic demands. Besides some handy tricks have been worked out in the pedal radiation to make the construction easy to realize. The manual/pedal axis follows the American standard, because Strauss is convinced that this is the only right choice. The center of the mostly played manual part is right above the center of the pedal. (d3 in the manual above b1 in the pedal). At the WCF congress 2000 a practice keyboard was set up by Verdin, to try out by anyone who wanted. It was the new practice keyboard for Berea, where the first Keyboard 2000 has been installed. I had the opportunity to test this keyboard for more than an hour. Although I find the depth of the manual keystroke (ca 35 mm) too small to control dynamics, all other dimensions are ideal for me. Strauss mentions explicitly that the depth of the manual keystroke is not his own deliberate choice, but was specifically made for the carillon of Berea and so might vary for other carillons. In the mean time the carillon of Berea is ready, also the instruments at Springfield and Kirk in The Hills are provided with a Keyboard 2000 and it seems like more carillons in the United States are to follow, like the one of Paccard for Redford, Michigan. Since Verdin has released the dimensions of the Keyboard 2000, Paccard should be able to deliver the same type. In The Netherlands the first Keyboard 2000 probably will be installed in the tower of Vlaardingen. Carillonneur Bas de Vroome is very enthusiastic and tries to persuade advisor Jaap van der Ende. The Dutch carillon Association has sent a letter to Vlaardingen to support the initiative. The carillons I play regularly, all have a different type of keyboard. The keyboard of the Waag at Alkmaar has the European standard, with the exception of the manual/pedal axis. The carillon of the Big Church in Alkmaar has a three-octave keyboard following the so-called Waalrese variant, with the pedal moved a quarter to the left side (c1 under g1). At Velsen recently a four-octave version of this Waalrese variant has been installed. The budget did not allow a Strauss keyboard, only a lateral shifting to the left, which had the advantage that the pedal could be enlarged until a2 without enlarging the whole keyboard. The Old Church in Amsterdam has, as mentioned above, a forerunner of the Strauss keyboard. The pedal runs from c1 to a2, with c1 nearly straight under g1 of the manual, like all American keyboards. Sitting behind a keyboard with European dimensions, I find myself right in front of manual key d3, which is in the middle of the part that is mostly played at a four-octave instrument (g1 to g4). At the European standard the d3 of the manual is under pedal key gis1. When the carillon has a g0 and bes0, this gis1 is almost in the middle of the part to be played with the feet (g0 to g2). When the pedal reaches further than g2, a shifting to the left will be the solution for that higher pedal part. Since the extreme pedals of the Keyboard 2000 have a concave and radial position, the conditions for playing are optimized. The fact that the pedal has moved to the left compared to a European keyboard, I find very comfortable. In this pedal position, one can easily play with the feet the notes that are frequently played in both the manual and the pedal (g1 to g2), which is a great advantage. Today the adapted three-octave keyboard, the Waalrese variant, is seen frequently in The Netherlands. Here the c1 key of the pedal is right under the g1 key of the manual, just like the Keyboard 2000. The three-octave manual is optimally played and all pedals are easy to reach. At this type of keyboard I always find myself a little bit shifted to the left, namely right in front of b2 of the manual. Three-octave carillons often are lightweight, which has the consequence that the third octave does not have a bright sound to get the melody part. The second octave (c2-c3) is the mostly played and also the best sounding octave. A three-octave Keyboard 2000 would have to be built with a smaller pedal. If a three-octave carillon reaches d4, the manual stops above the f2 of the pedal and therefore the pedal should not go further than g2. I felt at home in no time at the practice keyboard of Berea during the congress in Springfield. Also because of the European manual and the resemblance with the keyboard at the Old Church, adaptation time was short. Pretty soon it became clear how comfortable a radial and concave pedal is, besides the fact that the whole pedal has moved somehow into the keyboard. All keys are easily reached, in short an ideal keyboard. With all this, the question if there has to be a world standard and if this keyboard is indeed the candidate, has not been answered yet. From all the types of variants that appear in different towers, and from the discussions that are held, it is clear that people are not satisfied with the dimensions of the European keyboard of 1983. Also in the United States people think about changes to the American keyboard standard. The question remains whether a world standard keyboard is desirable and if yes, if it will be possible to get there. Often one takes for granted that standardization is a positive development, but sometimes things are so common, that any reason for standardization disappears. Furthermore there are century-old traditions preventing positive changes. Everybody knows the example of the violin. Although it would be much more comfortable to play it when holding the violin right in front of you, no violinmaker will make such a deviating instrument, leave alone the fact that any violinist would play the thing. Yet, in the traditional way one almost has to overturn his left arm to get to all the notes on the violin. In the seventies an ergonomic keyboard was developed for typists, existing in two parts, one for the left hand, one for the right hand. Although it was clearly an improvement, it became a failure since no typist wanted to work with it. Tradition and habit have a strongly delaying influence upon change processes. Also in the carillon field conservatism and tradition are endangering changes. A new standard keyboard is not to be carried out in one day. Carillonneurs will have to get used to it and try out prototypes, and then time will tell what people will accept. However the Keyboard 2000 is not just a new keyboard. The design builds upon experience with earlier designs, combining the best elements of two existing standards. A skilled engineer, who is moreover an amazing carillonneur, has looked upon the design with an ergonomical eye. 1. Do you believe in a world standard keyboard? 2. What is your experience with this new type of keyboard? Have you played the practice keyboard at Springfield, the carillon at Berea, the carillon at Springfield? 3. What is your opinion about this design comparing to the American standard? And comparing to the European standard? 4. 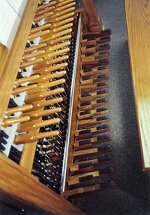 Do you believe there should be one type of keyboard for each type of carillon: for a three-octave carillon the same type as for a "Grand carillon" with more than four octaves? There were some twenty reactions from carillonneurs who had tried the practice keyboard at the congress in Springfield, or the carillon at Berea or Springfield. Most of them answered positive on the first question. On the average people were very positive about this new design. Everybody believes this new keyboard is an improvement compared to existing keyboards. Criticism exists on the small profundity that apparently has been chosen as a standard both for Berea and Springfield. Only one person thought the Keyboard 2000 was only an improvement for Europe and not for America concerning the changed manual key centers. Surprisingly the American carillonneurs need little adaptation to the narrower manual (75% of the reactions came from the US). John Courter, carillonneur at Berea, mentioned that one of the performing carillonneurs at the Springfield festival in 2001 said he had done some of his best playing ever, due to his relaxed feeling at the keyboard. The Keyboard 2000 of Richard Strauss is designed from a great musical, technical and ergonomic insight. Most users experience the keyboard as the most enjoyable they ever played on. If a world standard can be introduced, this one is a serious candidate. However it should not be looked upon as a world standard dictated by the WCF, but as a further development of existing standards, in order to draw a line and to prevent proliferation. Therefore the keyboard committee of the WCF would like to propose to recognize the Keyboard 2000, as a third standard, which can later on possibly become a world standard. Full discussion, for instance during the world congress at Cobh will give this choice a broader carrying capacity.